As we come to the close of Week 1 of the 30 Day self-love and yoga challenges, I realize that a couple of small hurdles have pushed me to practice self-love in completely different ways. Lots of rest, yin practices, candlelit meditations, warm chili and cornbread and nesting under warm blankets wearing fuzzy socks were on the menu. While a small cold kept me away from the studio at the beginning of this week, I’m fully planning on recommitting myself to the challenge of daily in-studio practices for the rest of November! I’m missing the warmth, hugs and smiles of the wonderful Viveka community! Tonight, I’ll be guiding a workshop at the beautiful Viveka Yoga, focused on Pranayama, or conscious breath. In my 3+ years as a yoga teacher, this will mark my first ever workshop. I’m so excited to share my fascination with the breath, and all the wonderful practices we can engage in to deepen our connection. I’m also nervous – will students want to listen to me talk for close to 2 hours? Will I succeed in sharing and conveying all the wonderful aspects of conscious breathing? Will I crack a [breath] joke that will be met with blank stares? (Worst. Feeling. of. Life.) Building and writing out the workshop this past week has been the best – I’ve revisited books and guides from my YTT days that i haven’t opened in a while. Throughout the process, i’ve tried to write and construct from a student point of view – as a student, what do I want out of a Pranayama workshop? It’s been really exciting to try my hand at building a workshop for the first time, and i hope the response is positive! The challenge of writing a workshop brought a very interesting aspect to my 30-day self-love and asana challenge. The excitement and challenge of being asked to do the workshop, and the energy surrounding the process have made me nervous and doubtful of my inner voice, my ability to convey my passion. My self-love practice has been put to the test this week, and has helped immensely. The power of positive affirmations is awesome. Instead of falling into the trap of my inner voice becoming my own worst enemy, kicking me when i’m doubting myself, i’ve practiced positive self-speech, and lots of meditation. These practices have made me feel confident, present and excited for the evening ahead. If you’re in the Lachine area at 7:30PM tonight, come join in the breath! Also on the meditation front, i’ve fallen in LOVE with Canadian company Tiny Devotions. Their malas are stunning, their jewelery is drool-worthy, and their blog is adorable. They have an incredible post on how to choose a mala, which i found super informative. 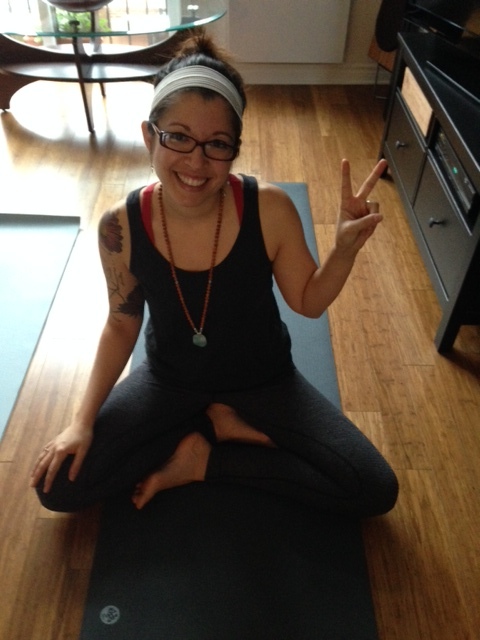 I own the Amazonite Mala, and i feel like when i wear it, i can take my intentions with me wherever i go. And conquer the world, of course. I love placing it in front of my mat during practice so i can have it in view during particularly challenging asanas, or when my focus is drifting. Check them out, support such a cool company, and send them some love!